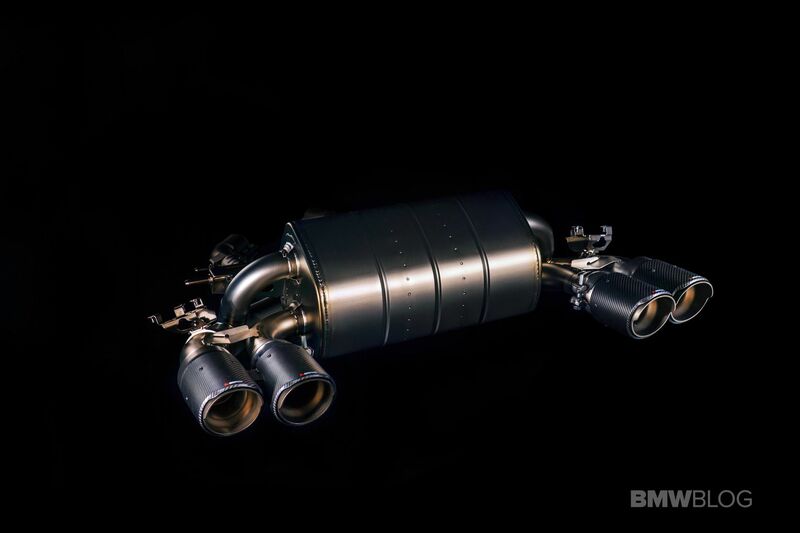 After weeks of initial development, I can finally give you a glimpse of the titanium prototype Slip-On Line exhaust for the BMW M2 Competition. Audio clip included! This might well be the moment many BMW M2 Competition owners have been asking for the last few weeks. 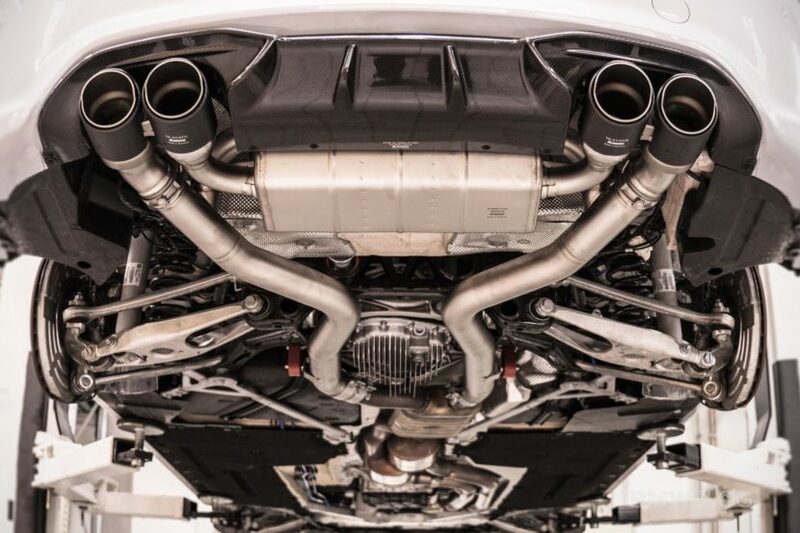 The Slovenian exhaust manufacturer has finished their prototype exhaust and I can give you an initial look into its characteristics after it was fitted on my EU-based BMW M2 Competition. In the story here, I will touch on a number of different subjects, such as the sound, tone, interior cabin sound, and more importantly the looks and weight improvement. It follows my previous introduction into the development of the new exhaust system which I shared about two weeks ago. Let’s first touch on the story behind the development of the slip-on exhaust system. 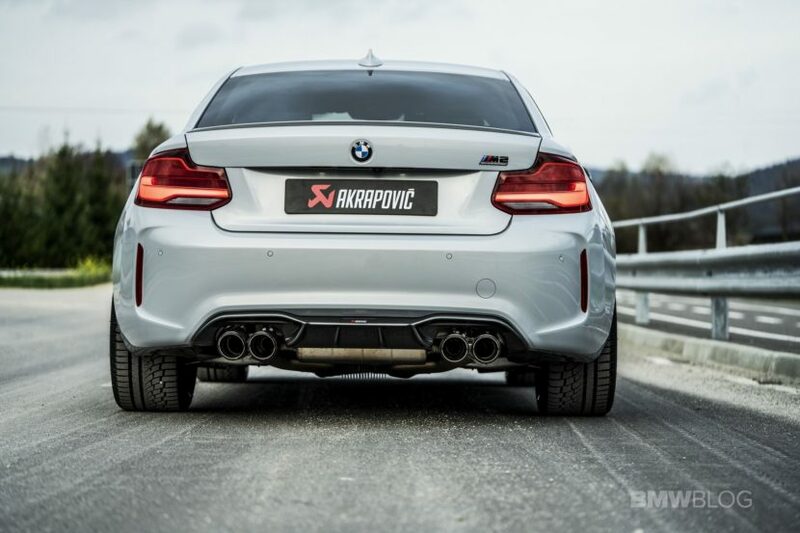 According to the engineers at Akrapovic, the main aim with regards to the development of this particular slip-on exhaust system and its sound track was to tackle the impact of the standard OPF filters, especially with regards to the tone of the exhaust. This meant offering a more sporty sound, add more volume across the rev band and have an ECE type approved sound level. The Slovenian company performed tests with the ASD system (also generally known as the interior fake exhaust sound coming out of the speakers) enabled and disabled. 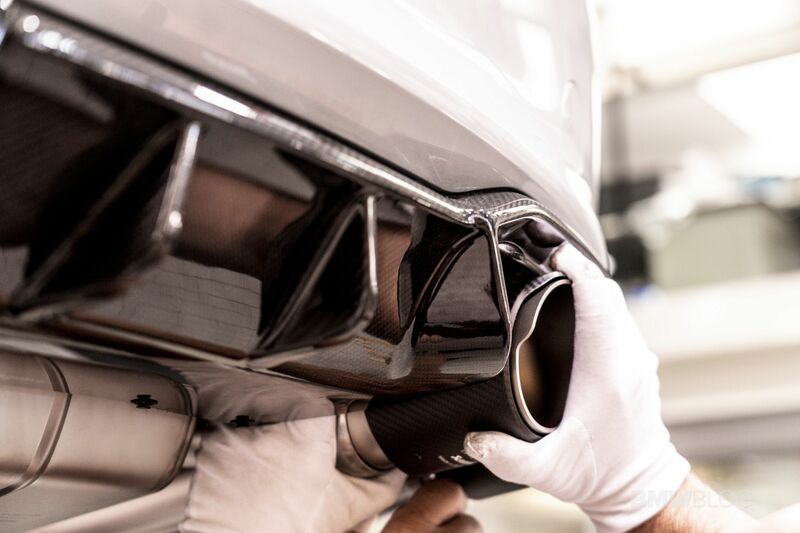 Following their in-house sound engineering measurements Akrapovic found that the internal sound with the slip-on system (measured without ASD) provided a richer note across the rev range and improved the linearity of the sound coming from the four exhaust tail pipes. Before touching on more specifics with regards to the exhaust system and my overall personal experience with the system across a 3,000 km road trip, I feel we should first touch on some key ingredients with the regards to the system itself. First of all, it is important to note that the system is a slip-on which means that both pipes coming from the center muffler are cut and during the installation the slip-on is connected to these two pipes. The pipe diameter of the slip-on exhaust is slightly bigger than the standard exhaust’s pipe diameter and therefore a sleeve is required. 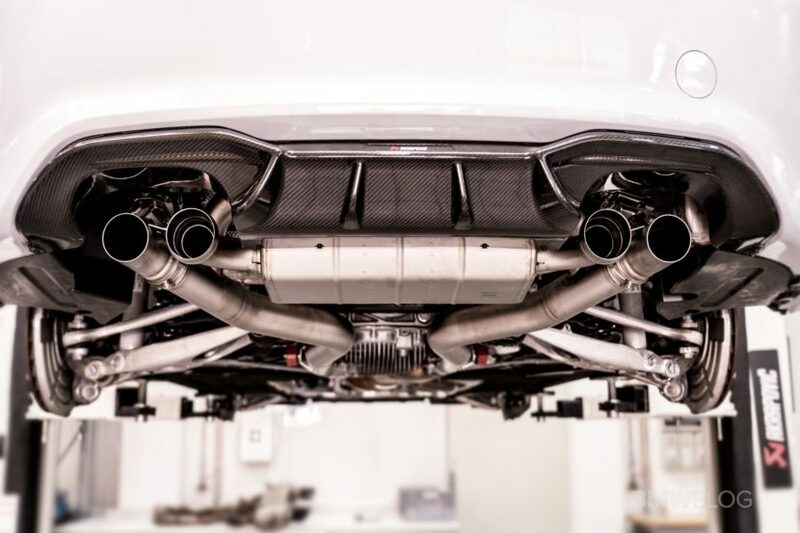 Additionally, the titanium system comes with four carbon fiber tail pipes which have an increased diameter over the stock tailpipes and are similar to ones used for the M3/M4 system. Their design, that improves the sound experience in the cabin, is similar to the Akrapovic system being available for the BMW M5 (F90). The homologated system features two valves on either side of the muffler offering a more direct flow for the outer pipes when both valves are opened. 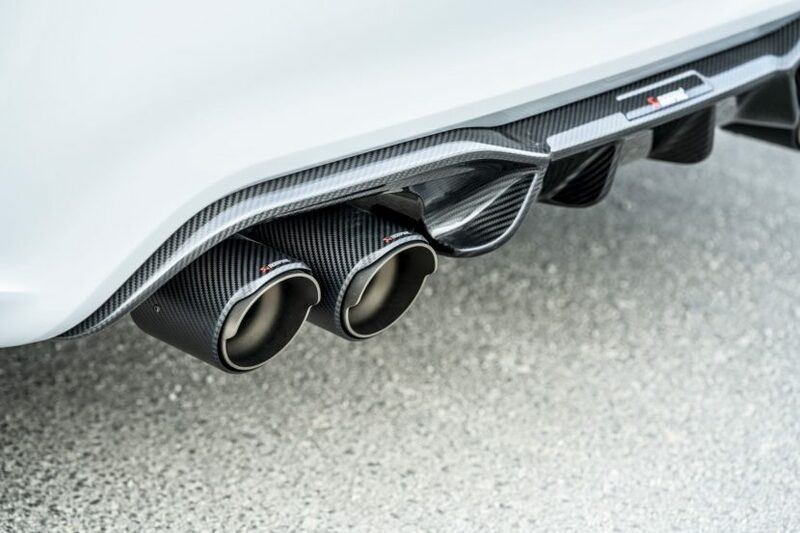 The valves are controlled through the internal ECUof the vehicle, which reacts to the driver’s choice for the Efficient, Sport or Sport Plus modes and the throttle input, or – that will be offered optionally – via Akrapovic Sound Kit Bluetooth remote (more on this below). In Efficient mode the valves will stay closed in basically any circumstance. The valves open when you move to Sport or Sport Plus mode, but only after you have provided the right kind of throttle input. While cruising the valves close until the driver provides the necessary input and the valves open again. The Bluetooth remote allows the driver to overrule the standard behavior of the car and “manually”open and close the valves. When you press the button on the remote, it either closes or opens the valves accordingly. The Bluetooth remote is not homologated and only intended for track-use. A nice feature is that you have the ability to startup the vehicle in loud mode using the remote. This is done by first engaging the ignition of the car, after which the driver opens the valves with the remote and then starts the car accordingly. On the subject of weight, Akrapovic predicts that the final product (combination of slip-on and four tail pipes), which will be available by the end of the first quarter next year, will offer a weight saving of close to 50% with regards to the stock rear muffler system. 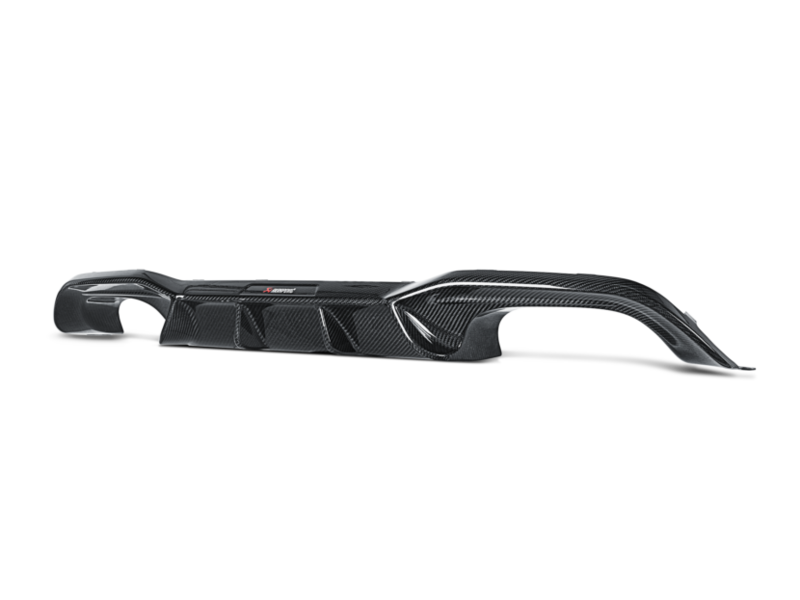 The Akrapovic Slip-On Line in combination with the titanium link pipe will provide a weight saving of also close to 50%. Of course, this is only when the cat-back system is fitted to a EU-car. The weight saving is pretty decent. The obese muffler and the two OPF filters have a massive impact on the weight of the stock system. Now that we ran through all the specifications and technical details it is time to listen to the exhaust and me sharing my initial thoughts with regards to the prototype system. Below you will find a video created in collaboration with Dutch YouTube influencer Carvlogger. Make sure to follow him on Instagram and YouTube, he is a true Bimmer fan! But let’s go back to the exhaust and my experiences. Firstly, I have to note the improved looks. The obese chin is gone! Hoorah! The new muffler fits wonderfully inside the space available under the rear of the car. The four carbon tail pipes are a great feature and stick out of the back staggered while being complemented by the optional Akrapovic carbon fiber diffuser. The improvement of the looks is not the only thing to note! The improved sound track is of course a welcoming addition to the standard BMW M2 Competition. I can now finally hear the exhaust inside my M2C. The burbles are much more noticeable and combined by a more aggressive and bolder sound track from the back. Through the gears there is noticeable more sound inside the cabin. Personally I would prefer a touch more sound, but for those that want just that want more experience inside the cabin, this slip-on system is definitely the sweet spot. On the outside, the sound track is noticeably different. Across the rev range, the prototype exhaust fitted to my M2C offers a lot more volume while never crossing the legal exhaust volume levels. At the top end of the rev range, the system has a similar volume as the stock system. The clear difference is in the rest of the rev range where the Akrapovic exhaust offers a much wider, bolder, more sporty sound track with louder burbles in Sport & Sport Plus. The M2C has surely come alive! On load the homologated exhaust offers you an enhanced sound track both on the inside and outside. The difference between valve closed and open is immense! It allows you to cruise with ease and be more quiet when required. As a suggestion I would urge all owners to remove the fake exhaust sound inside the interior, the so-called ASD system. Through coding or by installing a bypass harness, the ASD can be disengaged offering the driver a much more natural and pleasant exhaust tune inside the cabin. The fake ASD tone inside the cabin is known to act as a mismatch when an aftermarket exhaust is fitted. Removal is therefore advised if you want to have the full quality experience! The next steps in the current development process are the testing and installation of the prototype link pipe. The titanium link pipe is a non-homologated option and only allowed for track-use. The link pipe replaces the OPF filters and the center muffler, offering a lot more air to breath for EU-cars. Tuning specialists expect that the removal of the OPFs will offer an immediate gain of 20 hp before any additional tune has been installed. The coming week will show what the outcome will be. Interestingly, the set up including the linkpipe will sound similar to what drivers of non-EU cars can expect. As soon as testing has been finished, I will of course update you on the outcome and share a sound video of the full setup. If there are any questions in the meantime, please feel free to share them in the comment box below or reach out to me via my Instagram channel. Previous post 2018 LA Auto Show: Hyundai Palisade — Budget Three-Row Beast?